Ever wondered how long it would take to beat the game you’re currently playing? Maybe you have a weekend off with nothing to do and want to try to beast-mode through that new first-person shooter campaign or the arcade mode of your favorite fighter in order to unlock everything so you can stomp out some foes online. But, you’re not sure you’ll be able to do that because work, school and other annoying responsibilities may rear their ugly heads and cut your play session short. If you’ve ever found yourself in this situation, www.howlongtobeat.com is what you’ve always dreamed of being able to utilize. This website is dedicated to providing gamers not only with the length of time it takes to complete the campaign mode of a game, but how long it will take to complete the game 100 percent. The site works on a user-based averaging system, taking all of the user data and coming up with a mean number that represents approximately how many hours it takes to complete the game, collect all the unlockables, grow your online ego by acquiring all the trophies or achievements and completing the game until there is nothing left to do. For example, according to the website, it takes 31 hours to complete the main story of Grand Theft Auto V. To finish the main game and all of the extras, it takes about 42 hours and to complete the single-player game to 100 percent, it will take a mind-blowing 73 hours. You can sign up for an account on the site in order to submit your completion times, or you can just search for the game you’ve had your eye on for a while. 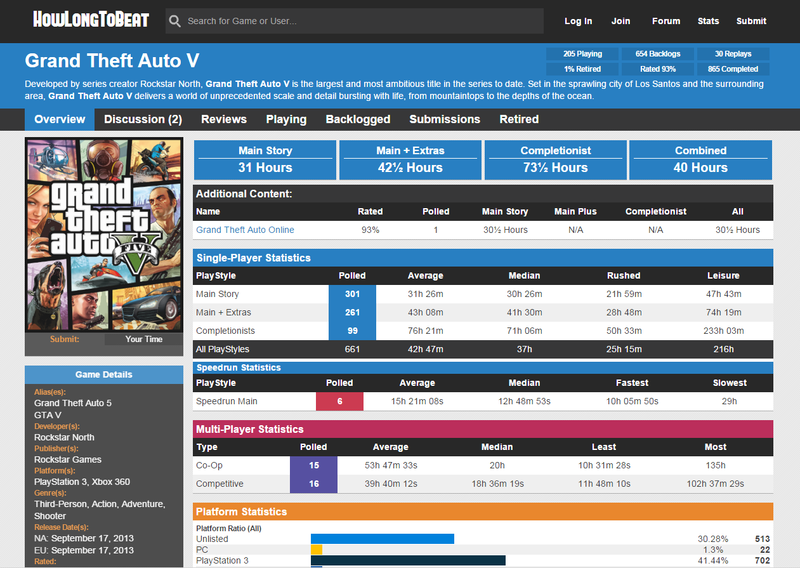 The site also features statistics, showing data such as the games with the most submitted completion times. In addition, there is a community on the site, complete with forums and more.